There are close to 400 works of public art in the City of Boston alone, ranging from permanent to temporary, from bronze sculptures to paintings to electronic marquees. In New York City there are close to a thousand. Some are passed by without a glance, others, like the Statue of Liberty, inspire. Not included in these numbers, however, are the numerous buildings that surround us with internal and external design aesthetics so striking that they should be counted just the same. At Consigli, they strive to build these projects because of their lasting impact on the community, not just through their incredible beauty but with the impression they can leave on their surrounding landscape. Though unique projects often present extraordinary challenges, they make sure to get the job done right by doing it ourselves, not through subcontractors, but through our extensive staff of expert masons and carpenters. The benefits of self-performance are enormous because Consigli has complete control of a project’s quality, budget, schedule and safety. Located next to the Massachusetts Institute of Technology, the new Novartis Institutes for Biomedical Research headquarters in Cambridge houses cutting edge research laboratories and administrative offices. But it’s what’s on the outside that has people talking. 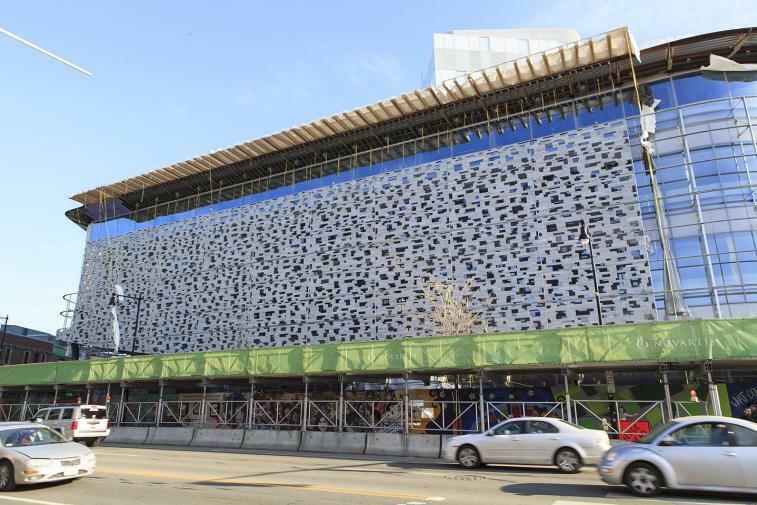 Just like the Swiss pharmaceutical company itself, the building’s façade is both striking and innovative, featuring more than 28,000 granite stones to create an intricate pattern that’s more than just unique, it’s remarkable. Wrapping nearly the entire building, the stone structure is held together by 314 steel frame panels measuring 5 by 16 feet and housing 115 stones each. Consigli master mason Bob Levitre said the challenging job was a thrill to work on, but also delivered plenty of heartache. Levitre’s team included Project Assistant Michelle White and Special Projects Manager Mark Morrow, as well as subcontractor JC Stone in Maine and a whole team of skilled and dedicated masons and laborers. Before work could even begin, figuring out how to physically make the design by partners Maya Lin and Bill Bialosky made on paper a reality was a challenge in and of itself. To test the structural integrity of the plans, that called for each stone to be adhered with a combination of a sixteenth inch of epoxy and stainless steel pins, Levitre and his team spent two weeks putting a 16 by 35 foot mock wall through multiple wind, water, vibration and fracture tests. The plans passed flawlessly, a testament to the good work and high level quality of the design and engineering plan. Additionally, the testing also approved custom colored and temperature sensitive epoxies to hold the massive 928,000 pound structure together as work on the project ran through the winter. Such a unique design required innovative techniques and it was clear to Levitre that premium on quality craftsmanship was high and attention to detail was paramount. To put the entire wall together, each frame was assigned an individual pattern, and each stone was assigned a different number that fit into the master plan like puzzle pieces. In other words, each stone’s place was special and specific to the grand design, like stars in a galaxy. The process of laying the stone was painstaking. Because a combination of stainless steel pins, fast set and regular epoxy was used, each panel was dry laid first to ensure that the stones fit properly, then were permanently glued into place. “There were no room for errors, there were absolutely no redos,” Levitre said. Like any project, there are always surprises that you have to be prepared for and the Novartis wall was no different. In fact, it was Consigli’s own master masons and ability to self-perform that kept things moving even when the unexpected struck. 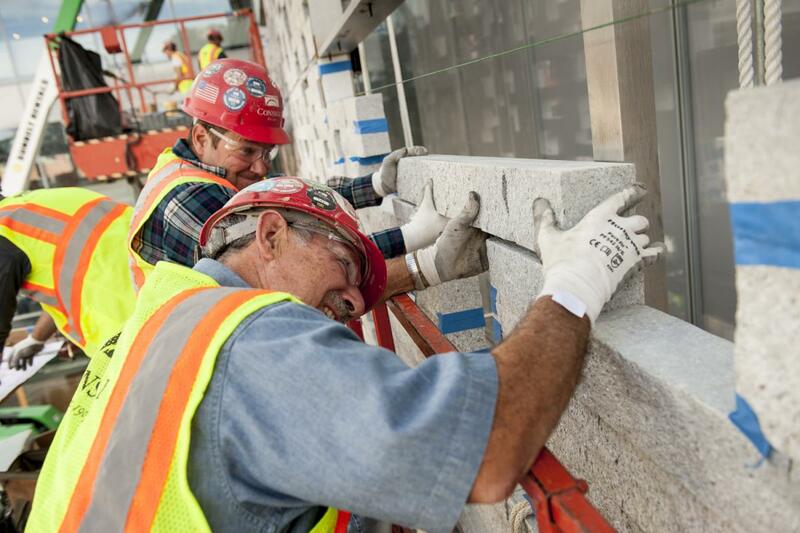 All stones were precut offsite according to specifications but due to field conditions, Consigli masons often reworked the stones onsite to achieve perfect quality and alignment. In fact, as the wall curved around three different parts of the building, the stones needed to be mitered at various angles to maintain the smooth façade of the flat portions of the building. Once the final stone was set, the entire structure incorporated close to 46,000 linear feet of stone, representing 16,500 square feet and 5,500 cubic feet. But the job wasn’t done yet and Levitre and his team were driven by their attention to detail. As they were laid and the epoxy dried, each stone self-adjusted, causing gaps that would have compromised the integrity of the structure. Like a fine tooth comb, Bob’s team checked all 28,000 stones to ensure that each had the right amount of epoxy and all voids were filled. “It’s just going the extra mile to make sure everything was the way it needed to be,” Levitre said. “Every stone needed to be supported the right way or the entire structure would fail.” The structure hasn’t failed and now, thousands of people pass by the beautiful exterior every day and when they stop, it’s not to marvel about the innovation taking place inside, it’s to talk about the work of art they are taking in. With more than 50 major institutions of higher education, the greater Boston area sometimes goes by the pseudonym Hub of the Universe – where great minds come together to make a better tomorrow and shape our future. 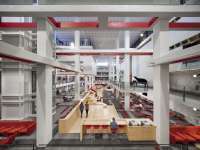 Perhaps then it should come as no surprise that as one of those institutions, Northeastern University wanted to make an impactful statement when it renovated its own hub. 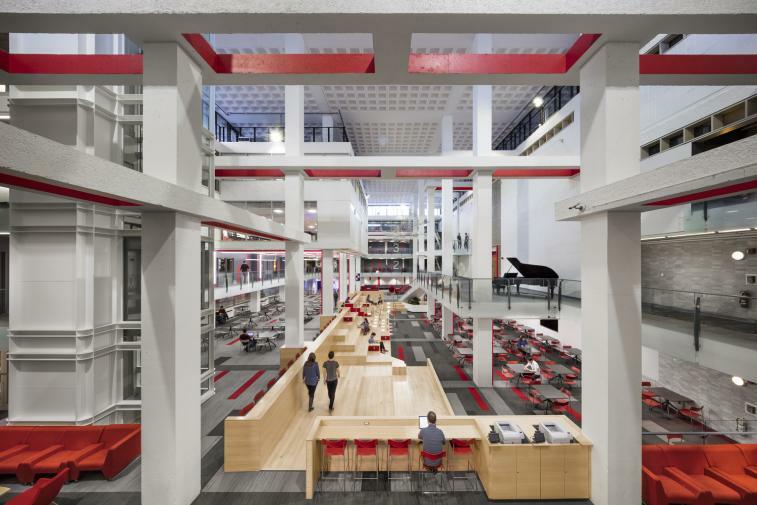 Plans for a complete overhaul of the Curry Student Center included the installation of an elaborate glass railing, new paint, furniture, carpet and floor finishes, selective lighting updates and several large LED panels and interactive kiosks to serve as student notification systems. But university officials saw a special opportunity at the center’s heart to not only provide a one of a kind seating area for students but the possibility to create a piece of art so unique in design, it would certainly be counted as one of a kind in Boston, a kind of hub of the Hub. The result was an 80 by 24 foot long steel and wooden framed seating area that resembles a cross between a post-modern bleacher system and spaceship. Affectionately called the Living Room, the massive seating structure that features more than 6,600 square feet of clear maple wood was completed during the school’s eight week summer break. “We knew it would be a tight time frame but that we had just enough room to procure all of the material and do the work without falling behind schedule,” Assistant Superintendent Tim Driscoll said. The first step required Consigli engineers to match their design plans for the metal framing and wood work with the architectural drawings. What they discovered in the process was a complicated structure that required an intense attention to detail. To achieve the desired look, every joint between wood panels had to align vertically to eliminate random esthetic imperfections, meaning two things: engineering a sound structure would be a chore; and supply was critical as pieces would be cut to such specific requirements that more wood was used than normal. Consigli’s self-perform capabilities maintained the project’s schedule as workers made onsite modifications to not only meet the architect’s vision but also structural requirements. The finish was a clear polyurethane, so the maple wood was difficult to work with as even the slightest spaces between pieces appear as black lines, ruining the structure’s appearance. And because the pieces had flat edges instead of curved grooves allowing them to fit like puzzle pieces, Consigli carpenters used a time consuming system of wedges to hold them together while they were glued and nailed permanently in place. “This was something that we know to do as carpenters over the generations,” said carpenter Willie O’Brien. “It’s not something that you would typically do except on flooring, but we were able to use the wedges here to make the structure fit together beautifully.” The result of all of this hard work, improvisation and self-perform ability is the Living Room. A uniquely designed common area that serves as the main focal point for a newly renovated student center. A work of art, really. 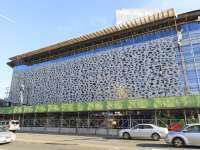 Via Consigli Construction Co., Inc.
Image,video ©: Consigli Construction Co., Inc.